We're very pleased to announce the completion of American Neighborhood Change in the 21st Century, a significant project we've been working on for many months. It's a new study of the ways American cities and regions have evolved since 2000, designed to capture, in unprecedented detail, the process of growth, decline, displacement, and poverty concentration across the nation. The study is available on the Institute on Metropolitan Opportunity website. The study categorizes all US census tracts by the changes they underwent between 2000 and 2016. 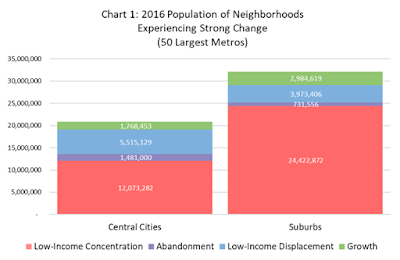 The report develops and utilizes a four-dimensional model of neighborhood change, which differentiates between overall growth, low-income displacement, low-income concentration, or abandonment. This spectrum of neighborhood change was devised to solve a problem faced by some other studies: the tendency to analyze neighborhood decline or gentrification in isolation, and in the process ignore the relative prevalence of each. As a result, while researchers could suggest a particular area was gentrifying or declining, it was difficult to resolve debates about which type of change was a bigger problem, and where. Our new study also corrects a major shortcoming of some prior research into neighborhood change, which is the tendency to artificially omit many geographic areas from analysis, either because they are initially deemed "ungentrifiable" or because they fall outside central city borders. Housing markets and population flows do not stop at city borders, and middle-class areas as well as poor areas are constantly facing pressure to change. By considering all tracts eligible for change regardless of location or jurisdiction, we hope our study can provide the holistic view some previous efforts have lacked. 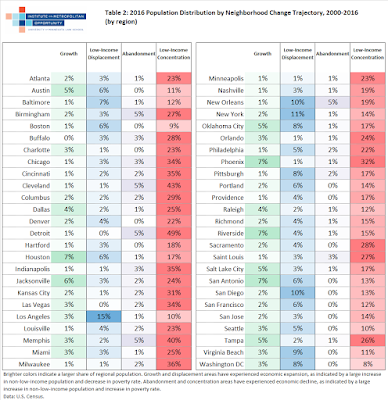 As the chart suggests, the study reveals that dramatically more Americans live in areas experiencing low-income concentration than any other form of neighborhood change--and most of those residents live in the suburbs. Low-income displacement, a hallmark of gentrification, is the next most common type of change. A relatively small number of people live in areas experiencing outright abandonment across the income spectrum, although these areas represent some of the most trouble neighborhoods in America. As the table suggests, low-income concentration is commonplace in most metros and the overwhelming trend in many. Declining industrial regions like Detroit or Cleveland the show largest amount of concentration. By contrast, only a few regions have a larger share of overall population living in areas with growth or low-income displacement than in areas with decline. These findings only scrape the surface of the study. The full study includes a plethora of resources for analyzing neighborhood change, designed to be easily interpreted by policymakers and residents alike. 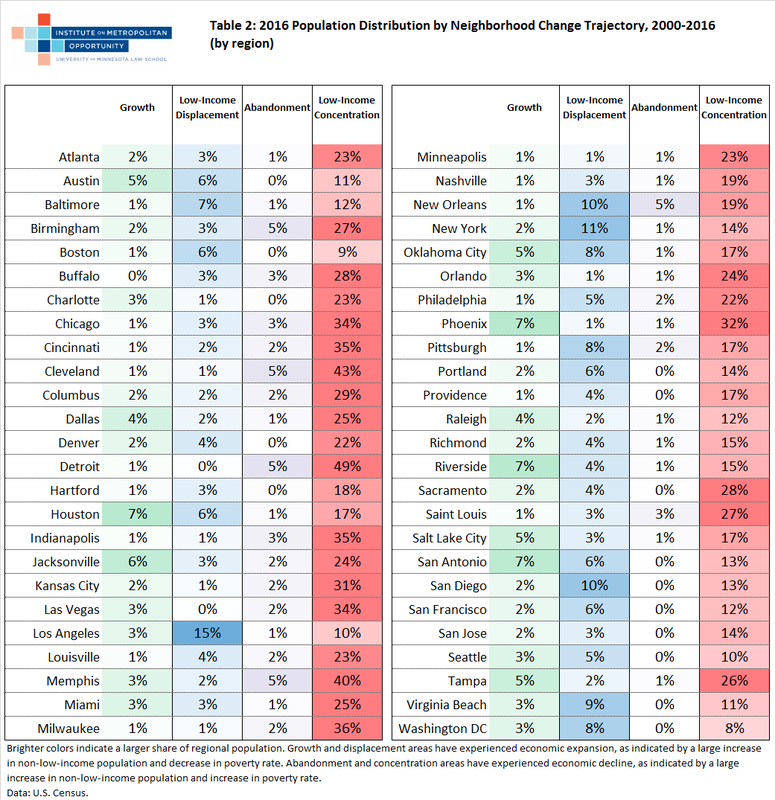 These include an interactive national map of low-income displacement and concentration, detailed tabulations of the effects of neighborhood change on over 20 demographic subgroups, and individual reports tabulating and mapping types of neighborhood change for each of the 50 largest metropolitan areas. We're particularly proud of these regional maps, which we feel are highly informative and easy to read. We'll be writing up many of the report's other findings over the coming days and weeks, but for now, we'd love for you to peruse the these findings yourself at https://www.law.umn.edu/institute-metropolitan-opportunity/gentrification. Congressional leadership, major labor leaders, and some of the United States’ top legal and social science thinkers will come together at Rutgers University in New Brunswick, New Jersey on May 2 and 3 to help rebuild a national movement to defeat segregation, promote racial justice, and provide economic equality. Leaders and advocates for civil rights, labor rights, and economic fairness are invited to join. The 2nd annual Summit for Civil Rights comes at a difficult political moment for the civil rights community, when its values are being forgotten in institutions such as the federal Department of Justice and the U.S. Supreme Court. This national Summit is intended to reverse this narrative of defeat and decline, and explore the ways in which this dark political moment is in fact a time of immense social opportunity for racial and social justice, rooted in unexpected places. Growing diversity, particularly in the suburbs that elect a majority of the nation’s political leadership, has made the politics civil rights viable once again. In these places, an unrecognized and untapped coalition is forming, one that could reshape America. The time and place of the Summit were chosen to take advantage of two major developments in civil rights: the advancement of two major statewide school desegregation lawsuits -- one in New Jersey and the other in Minnesota. At a time when the federal government has often been unfavorable to concerns about segregation, these pioneering lawsuits seek to use state constitutions to require state legislatures to pursue the long-delayed objective of school integration. In both states, this legislative and legal activity has given rise to opportunities for local and community organizing. The Summit seeks to leverage these developments to expand its diverse, multiracial coalition. That coalition will work to interweave school integration remedies into efforts to create housing justice and economic opportunity. The first Summit for Civil Rights, held in Minneapolis, Minnesota in November 2017, was a significant success. It brought together civil rights leaders including then-Rep. Keith Ellison, Rep. James E. Clyburn, and former U.S. Vice President Walter Mondale to formulate the principles of a state-by-state strategy for racial and economic opportunity. That strategy included legal, legislative, and community organizing components, all of which are reflected in the Minnesota and New Jersey proceedings. In addition, speakers will include over two dozen other top labor, faith, political, and intellectual leaders. For more information about speakers, please visit the Summit for Civil Rights website. Registration is available here. WHERE: Labor Center at Rutgers University, 50 Labor Center Way, New Brunswick, N.J. WHEN: Starts Thursday, May 2 at 1:00 p.m. (welcome reception and recognition ceremony for Rep. James E. Clyburn starts at 6:00 p.m.); Summit concludes Friday, May 3 at 4:00 p.m. The Summit for Civil Rights is presented by the Institute on Metropolitan Opportunity, the Labor Education Action Research Network at Rutgers, the Coalition of Black Trade Unionists, and Building One America, with support from the Ford Foundation and the UAW. For more details about the event, please visit the Summit website, https://summitforcivilrights.orghttps://summitforcivilrights.org/. The Institute on Metropolitan Opportunity is pleased to feature the School Desegregation News Roundup: periodic updates and reflections on educational desegregation and related issues, provided by Peter Piazza, an education policy researcher at Penn State's Center for Education and Civil Rights. Updates are crossposted on his site, available here. It’d be impossible to write a school diversity news roundup for March 2019 without talking about two major stories. On March 12th, we learned about an elaborate bribery scheme that wealthy white parents used as “a side door” into America’s most elite colleges. And, less than a week later, the New York Times wrote a story about appallingly low admission rates for Black and Latinx students in NYC’s elite high schools. A commonly cited example: in the city’s most selective school, Stuyvesant High School, only 7 Black students were admitted for the upcoming fall, out of 895 spots. It’s rare for school diversity to make mainstream news, but these stories are apparently shocking enough to be exceptions. (I even found the NYC high school story on Fox News, of all places.) When major outlets pick up this topic, it often has mixed results at best. In this case, understandable outrage over a small number of schools/universities can soak up a disproportionate amount of public attention, ultimately obscuring the many, more subtle and daily ways that racial injustice plays out in education. Nonetheless, when covered well, bald injustice like this at least has the potential to reach a broader audience and hopefully inspire greater awareness/debate etc about common school diversity issues. Especially because they came out so close together, these cases combined to illustrate themes that animate many lesser known stories- that, in the name of meritocracy, the system is thoroughly stacked against low-income Black and Latinx students; yet, at the same time, white people enjoy privileges that expose meritocracy as meaningless, invented and even laughable. NYC has eight specialized high schools, and admission to these schools is based exclusively on the scores from a single exam, the Specialized High School Admissions Test (SHSAT). As many articles pointed out, these are the only specialized high schools in the country that use only a single criterion for admissions- imagine, for a second, that there was an elite public university in the country, where tuition was free, and it only used the SAT to decide who gets in. Admissions letters for these 8 schools went out in March, and the rates for Black and Latinx students were indeed appalling. Overall, only 190 Black students were admitted across the 8 schools, which encompasses 4,800 seats. As noted above, only 7 Black students were admitted to Stuyvesant High School; that number was only slightly better at 33 for Latinx students. The original story has a great graphic breakdown of admission by race at each school. “NYC High School Admissions Creates Winners And Losers. I Lost.” by Muhammed Deen in the Gothamist. This was one of only a very few pieces that features a student’s perspective on the admissions system/process. It was written by a NYC high school grad who is now a freshman at Hunter College. He talks about his experience navigating the complicated high school selection process as an eighth grader and describes the inequities at his high school: “We weren’t allowed to take textbooks home. Our calculators rarely worked. I could not exit the building for lunch due to my school’s metal detector.” The author is an organizer with Teens Take Charge, which just launched an Enrollment Equity Campaign that spans all 450 public high schools in NYC. You can learn more about the group/campaign in this short video or by searching for #IntegrateNOW on twitter. “The New York City school controversy shows why standardized testing is broken,” by Jose Vilson at Vox.com. Written by an NYC teacher and public education advocate, this piece describes how teachers and their students are affected by the rejection letters. The author notes that “I’ve had to console far too many brilliant students who didn’t get chosen for the high school they wanted to go to. They checked off all the proverbial boxes: great attendance, high grades, strong work ethic, and had positive relationships with adults and peers.” But “because a student’s score on that test is the only criterion for high school admissions, the stressful three hours spent taking this exam could determine a student’s future.” This article also makes an important point about the policy that established the SHSAT, which was set by state law (! ), not by the city. Nearly every article notes that it will require a change in state law, then, to adjust admissions policies for these schools. However, the discussion almost always ends there, potentially leaving readers with the impression this is just a random/quirky thing that makes the process more complicated. Instead, this article connects the reliance on standardized assessment to the use of IQ tests as “a tool for pundits to argue that people of darker skins were intellectually inferior.” The author notes that the 1971 law – known as Hecht-Calandra – was itself a debate about race and enrollment. “Assembly Votes High School Curb,” by Francis X. Clines in the New York Times on May 20, 1971. If you have any lingering doubts about the role of race in Hecht-Calandra law, check out the New York Times archive from when the law was passed. It was ugly and sad. At the time, NYC’s mayor and chancellor seemed willing to reconsider the use of the exam. Specifically, when the schools chancellor merely initiated a study to look into whether the specialized high schools “‘were ‘culturally biased’ against blacks and Puerto Ricans,” supporters of the exam bypassed the city and went to Albany where they found “a white cross-section of Democrats, Republicans, Conservatives and Liberals” to sponsor and pass the bill. Meanwhile, wealthy folks have been buying their way into elite colleges. While we scoff at the excess, we accept the more common/subtle privileges as natural even when they’ve grown, over time, to become absurd. At the very least, folks who write stories about NYC’s specialized high schools should talk about the history here, and supporters of entrance exams should have to somehow address or respond to it. Again, however, despite the egregiousness here, it’s important to remember that any policy changes to NYC’s specialized high schools will only affect the 8 schools. It’s undoubtedly important, but it shouldn’t overshadow other important school diversity efforts in NYC and the larger struggle for school diversity across the country. True of the big stories and the comparatively smaller ones- broader change will come when white people begin to see the value of school diversity for their children, other children and society on the whole, and when they begin to act on it. In an effort to be more hopeful/uplifting, I’ll focus on those efforts in part 2 of the roundup next week. I want to start with an aspect of school segregation history that is important but may not be well known. Starting in the 1970-71 school year, Longview, TX was under a court desegregation order that included busing more than 600 Black students to formerly all-white schools. During the summer before busing was to begin, two white men entered the maintenance yard where the district parked its buses for the summer. They had two dozen bombs, which they arranged under successive rows of buses before detonating all of them simultaneously. According to this article from the NYT archive, 36 buses were damaged in all, with several considered “total losses.” Although suspects were not immediately evident, the two men were eventually found and convicted to 11 years each in prison. One of them had earlier set off dynamite at the home of a Black woman who lived in a white neighborhood. This story is retold in a stunning new series called Dis-Integration from the Texas Tribune, which looks at contemporary school segregation in four Texas towns: Longview, Edgewood, Richardson and San Antonio. One major theme: While we’d love to believe that this kind of senseless racism is stuck in the past, it is not so much gone as it has just changed shape. These are places where political apathy and a near-complete absence of oversight, guidance or public accountability threatens to allow schools to slide further into resegregation. As always, I recommend a full read- the stories are each relatively short and extremely engaging. Here’s a quick summary that, in the interest of space, focuses mainly on Longview. In this short segment on NPR’s 1A, there’s more detail on demographic changes in Longview and other challenges to preventing further resegregation. Given these challenges, the school board’s commitment to integration rests on a shaky foundation. Of course, integration efforts no longer have the backing of a court order and DeVos/the federal DOE just recently revoked guidance for voluntary integration efforts, like those in Longview. In an election cycle, the composition of the school board could change, and the priorities of the district could change with it. Also, even with a supportive school board, the series notes, “Longview is still a small town where many hesitate to talk directly about race. And people are divided on how they recount the racially fraught history or whether they acknowledge that same racism still exists today.” Preventing further resegregation, then, depends on political success of equity-oriented school board candidates and the willingness, in the larger community, to confront difficult historical truths. In Richardson, only one person of color has ever served on the school board of a district that is 60% Black and Latinx. That person recently filed suit against the city, claiming that a board composed exclusively of at-large seats denies fair representation to people of color. The article has a lot of fascinating detail about the struggle for this simple and commonsense form of representation. (See here and here for studies about how/why Black and Latinx school board members matter for students of color.) Ultimately, the district settled the lawsuit by switching to a hybrid school board: 2 at-large seats and 5 individual district seats (with at least 2 of those 5 coming from districts with a majority of people of color). If you want to dive in further, the reporters – Aliyya Swaby and Alex Ura – talk about the background/motivation for the series in this short video. You can also hear from them in this short (5 mins) and more in-depth (48 mins) discussions on public radio. Although an interesting and useful complement to previous coverage, the San Antonio part of Dis-Integration is a bit of an outlier for me. What I found most compelling was the look at school segregation in places that aren’t typically a part of this conversation, specifically: the suburbs (broadly defined) and places like small “satellite cities” that are experiencing rapid population change. In their 2012 book on the Resegregation of Suburban Schools, Erica Frankenberg and Gary Orfield note that “the United States today is a suburban nation that thinks of race as an urban issue” (p. 2). They observe that “the focus of racial and economic change is now clearly in suburban areas” (p. 1), as seen in the demographic changes that have swept over places like Longview and Richardson. That book looked at the characteristics of suburban schools in the largest 25 metro areas from 1999-2007. Among many changes, they found, that the percentage of students in 90-100% minoritized schools rose from 2.5% in 1999 to 13.7% in 2007 in satellite cities that surround the countries largest 25 cities. “There are no federal or state policies constructively addressing these issues, leaving every suburb on its own” (p. 2). In the Civil Rights Era, major federal and state policy change at least tried to move towards integration. Of course, much power came from historic court decisions and related court oversight. Now, as resegregation spreads further out to small cities and the suburbs, many of the same issues remain, yet court oversight has been decimated and policy guidance is hard to find. And there’s more. While cities are often home to civil rights groups that work to develop political infrastructure and public will for racial justice, these groups are less common in the suburbs. Though it’s a topic for its own post, the housing market and weak/non-existent enforcement of the Fair Housing Act present further obstacles to integration in the suburbs. At the same time, suburbs are growing and changing rapidly. According to a recent study of demographic change conducted by the Pew Research Center, the population in suburbs and satellite cities grew from 150 million people in 2000 to 175 million in 2016. Suburbs account for well more than the population in cities (98 million) and rural areas (46 million) combined. During the time covered by Pew, suburban areas grew at a faster pace than the urban or rural counterparts. They also became less white (8% decline) and poverty in the suburbs increased by 51%. This being the case, the importance of the suburbs in the school integration movement should not be overlooked. The Tribune series is an important effort to draw attention to these places and to highlight the complexity of their current political and social context. It’s hard to read these stories and not feel frustrated at the lack of movement on major problems or to not fear the fragility of the efforts that are trying to make some progress. It’s also hard to imagine success in school integration without more consideration of the types of communities (e.g., suburbs and small cities) that are home to the majority of US students. Yet despite the magnitude of the suburbs as a demographic category, when you read stories like those in the Tribune, you get such a strong sense of isolation (or, at least, I did). In these places, advocates for educational equity, deal with a complicated and shifting legal terrain, extremely limited funding, and ghosts of open historical violence, among other challenges. They are often in the political minority in their communities, and their success depends on somehow facing the future of school segregation with virtually none of the political supports or infrastructure that existed in the past. In case you missed it, this administration continued its effort to rollback of civil rights protections for K-12 students in its reversal of Obama-era guidance on school discipline. Specifically, the “school safety” commission convened after the Parkland shooting issued a report calling for a repeal of the Obama Administration’s 2014 guidance on school discipline. The report – signed by Betsy DeVos, Kirstjen Nielson and Matthew Whitaker – was released earlier this week (full text here). A few days later, the administration officially revised the Obama-era school discipline guidelines to align with the recommendations in the school safety report. Before talking about the guidance, I want to go to this map from ProPublica’s Miseducation website. I have just a screenshot here, but if you follow the link you can get to the interactive version. Under “measure” you can select “discipline” and then you can see a nationwide map of school districts where Black students are more likely to be suspended than White students. If you have a few minutes, try to find one district where this is “less likely.” (The numbers will pop up when you hover over each district.) I’ve spent a decent amount of time with this, and I still haven’t found a single district, in the entire country. As I’ve written previously, research points clearly to the harmful and racially disproportionate effects of unconscious bias and exclusionary discipline, and this has real consequences for students, their families and all of us. The Obama administration “gave schools a perverse incentive to make discipline rates proportional to enrollment figures, regardless of the appropriateness of discipline for any specific instance of misconduct.” In short, schools may have been right to discipline Black students more harshly than White students. This is what white supremacy looks like in policy. The report strongly encourages states to place more armed personnel in school. Along those lines, it recommends that districts make it easier for military veterans and retired law enforcement officials “to become certified teachers,” so that they can carry guns and use them if necessary. It does NOT recommend age restrictions on firearms purchases. The New York Times also has a great story about how the report plays down the role of guns in its decision to instead focus on discipline. And there’s a very strange connection between the two topics. Specifically, the report justifies its proposed repeal of the Obama guidance by essentially saying that its approach to discipline was too soft. Again, this entire report was commissioned in response to Parkland. The implication is that the Obama guidance had something to do with the Parkland shooting and/or repealing it will somehow prevent more school shootings. Cruz had been “expelled from school, banned from campus, and had been referred to law enforcement numerous times.” So he’d also been the subject of the harsher forms of discipline favored by the current administration. The PROMISE program was established in 2013, before the Obama discipline guidance had been released. It’s not clear if Cruz even attended the program. In other words, any connection between Parkland and school discipline reform is completely invented. It it further troubles me that the administration likely knew what they were doing and tried to bury it by releasing the new guidance on the Friday before Christmas. In the Harvard trial, there’s an understandable concern in that Asian American students are disproportionately rated lower in “personal characteristics.” But, SFFA is using this important, yet relatively small, issue to do something very big: end race-conscious admission across all publicly funded universities in the US. Again, you’ll see a similar theme in Hartford. So, to Hartford, where the Pacific Legal Foundation (PLF) has mobilized a group of Black and Latinx parents to file suit against the state because their children were not admitted to highly sought after schools in the city’s magnet program. As described in part 1, PLF has been a long-time opponent of school integration, fueling the 2007 Parents Involved case (more about this below). Like the Harvard case, this one represents a relatively new legal strategy in which opponents of race-conscious policy – like PLF and Ed Blum – mobilize non-white plaintiffs in cases that ultimately work against school diversity. The state of Connecticut, the defendant in Robinson, never wanted to integrate schools; so, it’s not going to put together a vigorous self-defense in a federal case. There’s a state court hearing scheduled for Feb 2019 to talk about fixes to the Sheff ruling. Integration supporters claim that this is the best way to address the problems raised by Robinson plaintiffs, not a federal trial. A federal judge is currently deciding the jurisdiction for the case, and that decision is expected soon. Plaintiffs: A group of seven parents who are filing on behalf of themselves and their children. LaShawn Robinson is the named plaintiff (pictured above). This article has interesting background about her and about the case in general. And, this blog post – a passionate defense of the case – was written by a friend of one of the plaintiffs. “The plaintiffs argue that the 25% “reduced-isolation student” benchmark is actually an enforceable quota, that the lottery is weighted to account for a student’s race, and that Hartford-area magnet schools are literally reserving 25% of the seats in their school exclusively for students who are not black or Hispanic, thereby creating an impermissible racial classification.” Like the Harvard case, plaintiffs are arguing there’s a kind of backdoor quota. Defendants: This is a really important point – the lottery used to assign students to schools does not include race. As pointed out here, “there was no place on the 2017-2018 lottery application form for an applicant to list their race.” This is the key argument from defendants. Instead of race, the lottery is based on things like home address, school preferences, and where their siblings go to school. After the lottery, if school enrollments fall outside the 25%-75% band mentioned above, schools are at risk of losing some state funding. Left out: Another key part of the defendants’ argument – Connecticut has refused to fully fund the magnet schools program in recent years. As you may remember, CT faced another major court case recently – after a state judge required a complete overhaul to the state’s school funding system, the state supreme court overruled the lower court, leaving the status quo in place. As described by that lower court judge, funding in CT is inequitable and “irrational.” Of course, this affects Hartford’s magnet schools. Defendants argue that this (along with other fixes) should be the focus of any changes to Sheff. At stake: There are two big issues here- race as a compelling interest in K-12 school enrollment and charter school expansion. This case could end up being a sort of relitigation of the 2007 Parents Involved decision. Although it’s widely believed that Parents Involved actually ended race-conscious K-12 enrollment, this is a misread of the case. Justice Kennedy actually agreed with the liberal justices that “diversity . . . is a compelling educational goal a school district may pursue,” and that includes “avoiding racial isolation.” But, he then sides with the conservative justices in striking down the Louisville and Seattle plans, not because of the fact that they used racial classifications, but because of how they used race (not narrow enough, in his opinion). This article has a great breakdown/analysis of the case. As a result, states and districts actually have a lot more legal grounds for voluntary race-conscious integration than is widely believed. PLF was behind Parents Involved, and they just narrowly missed their goal. Robinson is their second chance. I relied heavily on this article in the summary above, and I highly encourage a full read. This article is also extremely useful. These are two of the most thoughtful and detailed articles that I’ve found so far on this case. This blog post also contains a useful breakdown of the case, while going into more detail about PLF’s potential interest in charter expansion. Yeah – it’s a big deal. And, it’s unfortunate (to say the least) that groups like Students for Fair Admissions (the Harvard case) and PLF are exploiting fixable problems and legitimate concerns of non-white students/families as excuses for completely undermining systems put in place to balance the opportunities offered to Black and Latinx students against the enormous social/political opportunities that have been enjoyed by white families (especially wealthy white families) since forever. I’ll track each case and post updates.